In developing the 2016 Summer invitational tournament, we sought to bring a new team effort to Pickleball competitive play. Rather than a round robin format we selected to use the example of team rosters. Where a team of 8 top tier players from their home locations would come compete head to head with other teams of the same caliber in the Atlanta area. 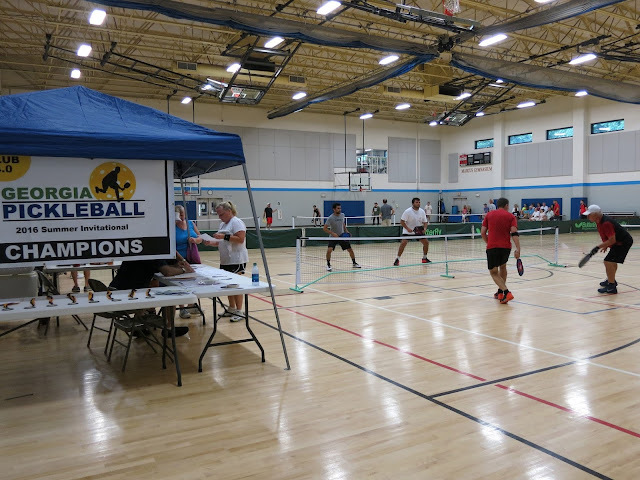 We wanted to partner with an indoor climate controlled environment to allow Pickleball players the ability to play competitively during extreme mid-summer and winter conditions. We were excited in partnering with the Marcus Jewish Community Center of Atlanta to host this advance level of Pickleball play. This beautiful facility currently houses 9 indoor Pickleball courts that will allow us to continue to grow and invite additional teams to participate. When we opened up the tournament registration the rosters were full in less than a week. This was a clear example for the demand of advance play in the Atlanta area. Our plans are to grow this as an ongoing event twice a year in the months of early February and mid-August to not interfere with most outdoor tournaments being held in the spring and fall months. This year the teams represented were the YMCA Lawrenceville / Athens Team / MJCCA Center of Atlanta /& YMCA Norcross. We will be expanding to allow additional advanced teams for the 2017 Winter Invitational.